Recently saw several apparently "abandoned" dockless scooters littering sidewalks in DC, and a hazard to pedestrians. It was a big day in the scooter wars, with San Francisco and Santa Monica each allowing a few players into their cities. Santa Monica issued permits to Uber-owned Jump, Lyft, Lime and Bird for its upcoming e-scooter pilot. San Francisco, meanwhile, eschewed those four in favor of two lesser known players, Scoot and Skip, which were each given one-year permits as part of its pilot program. The bottom line: San Francisco's choices suggest scooter companies might not want to follow the Uber model of asking for forgiveness rather than permission. Here are a few more thoughts from Axios' Kia Kokalitcheva, who's been covering the scooter wars. Bird, Lime, and Spin rolled out their scooters in San Francisco this spring before the city had finished formulating its pilot program. It wouldn't be surprising if local officials are holding that against them. As for Uber and Lyft, the two companies may still be dealing with their old sins — although Uber's Jump division has the only bike-share permit in San Francisco, raising questions about why that relationship wasn't rewarded. Scoot has been operating full-sized scooters in San Francisco for years and has already forged a positive relationship with city officials. Skip, also based in San Francisco, has only deployed its scooters in a few cities where it has obtained the city's permission. Because scooter deployment is so tightly regulated, including caps on the number of vehicles, having deep pockets to quickly grab market share won't work in this market as it did with ride-hailing. Our thought bubble: The companies that didn't get permits in San Francisco made clear they weren't happy. But don't be surprised if they soon change their tune, arguing that missing out on San Francisco isn't a big deal since they already operate in dozens of cities. Read more of Kia's full story. How much to hire one out? Cost varies by provider. Like bikeshare you can have daily, weekly, monthly, and eventually annual subscriptions, but the most expensive a single use, generally costs $1 plus 15c a minute. There's been an explosion of companies providing them. They are very effective in downtown rush hour when traffic is at a standstill. 10 times more popular than bike share. I wonder what will happen in Amsterdam where they fish 100,000 bicycles a year out of the canals. I think the law here is that if they are self propelled they need to be appropriately taxed, and the user licensed and insured. For example electric bikes here are 'illegal' if they are self propelled (distinct from 'pedal assist' where the user has to pedal to move and the motor just makes it easier). I've seen a few in Dublin, they don't seem to be policed as of yet. Personal car ownership isn't dead yet, but it's becoming less convenient, especially in dense urban areas. New transportation models are starting to take hold, and could eventually permeate even suburban areas. 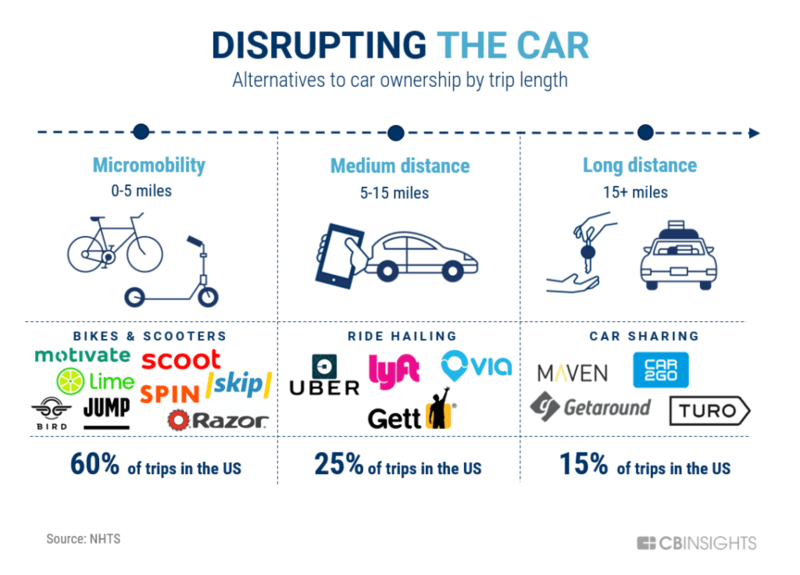 From electric scooters to bike-sharing to ride-hailing, we explore how these new forms of transportation are disrupting the car. Uber expects to have more scooter rental capacity than car ride capacity in a few years. Scooter startups Lime and Bird have each crossed 10 million rides, with Lime recently reaching 11.5 million, Axios' Kia Kokalitcheva reports. These are beginning to appear in Dublin - privately owned ones (I think). A decent one appears to cost about €500 - a lot cheaper than an electric bike. I'm a long-time Dublin city pedal cyclist - non-electric - and very familiar with the traffic risks involved in cycling and the protective drills that are necessary. In my opinion these scooters would be at much higher traffic risk due to their low profile - I wouldn't risk one in rush hour in the rain. I think they would be particularly dangerous for inexperienced riders (in Dublin anyway). Yes they are a higher traffic risk, there are some stats to support that. I can understand they would be less attractive in a wet Dublin rush hour. Someone needing to travel from say Parnell Sq. to Ranelagh or points south, might scoot to Leeson St. and then take a bus. That's where scooters are at their most valuable. The downside, they appeal to a younger demographic than typically cycles. In the US, Uber, scooters etc are causing a decline in travel by transit overall, but most noticeably by millenials. A 24-year-old Dallas man, who died after falling off a Lime electric scooter, was killed by blunt force injuries to his head, officials said Thursday, likely making him the first person to die while riding the electric mobility devices that have swept across the nation this year. The news arrives just after California Gov. Jerry Brown signed a controversial bill that makes it legal for adults to ride electric scooters without a helmet. The DC government has twice extended an initial pilot program for dockless bikes and scooters without changing any of its initial rules, including a limit of 400 vehicles per company which we've argued was too restrictive. Now, for 2019, there's a new version of program with some more flexibility, but also many new rules. America's two largest automakers are branching out beyond their traditional businesses: GM plans to launch a lineup of electrified bicyclesand Ford just bought an electric scooter company. Why it matters: By 2030, 60% of the world's population will live in urban areas, per the UN's World's Cities in 2016 report. As cities get more crowded, commuters are looking for alternative ways to complete their journeys, from ride-hailing to e-bikes to scooter-sharing — sometimes combining all three in a single trip. 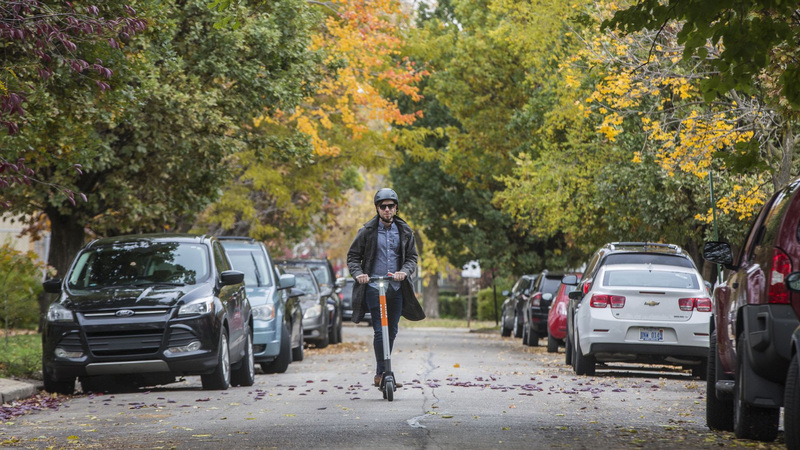 What's new: Ford just paid close to $100 million to acquire Spin, an electric scooter-sharing company based in San Francisco with operations in 13 cities and campuses across the U.S.
Ford had already dipped its toes into scooters with the recent rollout of its Jelly service on the campus of Purdue University, which also happens to be Spin CEO Derrick Ko's alma mater. What's next: GM will launch the e-bikes in 2019 under a new, as yet unnamed brand. The first 2 products have been designed: one foldable, the other compact, both using a proprietary propulsion system developed by GM. They'll be equipped with integrated safety features, including rechargeable front and rear LED lights. GM has launched a contest to name the new e-bike brand. The winner, to be announced in early 2019, gets $10,000. What to watch: Amid a massive shift in transportation, automakers like GM and Ford will likely introduce more of these micro-mobility services as a way to hang on to customers who no longer feel the need to own a personal automobile. Scooters are reducing car trips, study in Portland says. GGW’s David Alpert: “Residents and tourists are using e-scooters in place of car trips, and scooters are drawing people who've never ridden a bike or never traveled in a bike lane.